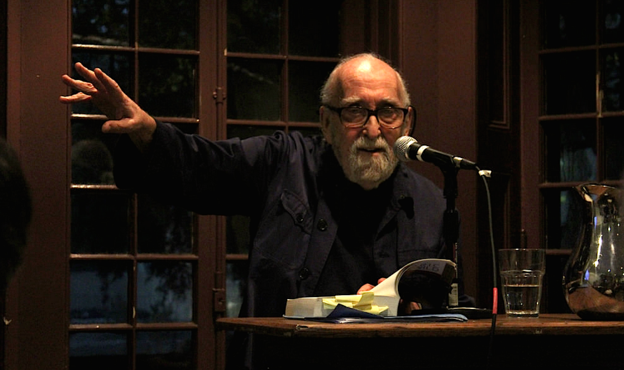 On September 10, 2015, Jerome Rothenberg re-visited the Kelly Writers House to give an evening reading. A few hours earlier, Ariel Resnikoff and Al Filreis met Rothenberg in the Wexler Studio for an extended interview/conversation that ranged across many epochs, poetic modes, and topics. Among them: the new young German poets of the mid- to late 1950s; the world of Jewish mystics Rothenberg discovered as a young poet; his time as a Masters student studying Dickinson and Whitman with Austin Warren at the University of Michigan in the early 1950s; “the four great Jewish objectivist poets”; Armand Schwerner; somewhat sudden access to major commercial presses for his anthologies in the late 1960s; Robert Duncan’s recommendation of Gershom Scholem; Paul Celan; and Rothenberg’s forays into the problem of representing the unsayable of genocide.